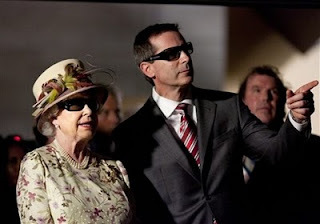 On Monday July 5, 2010 the Queen and His Royal Highness, Premier McGuinty and his wife visited Pinewood Studios in Toronto and were presented with a 3D demonstration/scene directed by Deepa Mehta. My colleague Brian Campbell and I produced this special one day event. A heart felt thank you to our entire cast and crew and for the generous support of all the suppliers who made this a very special day.